1. Floor Angles — 3/4 by 1-1/4 in. fabricated from 22 MSG galv steel, short leg attached to concrete or masonry with fasteners spaced 24 in. OC. 2. Ceiling Runner — Channel-shaped, 1 in. deep by 1-5/8 in. wide, fabricated from 25 MSG galv steel, or two 3/4 by 1-1/4 in. angles fabricated from 22 MSG galv steel, attached to ceiling with fasteners spaced 24 in. OC. 3. 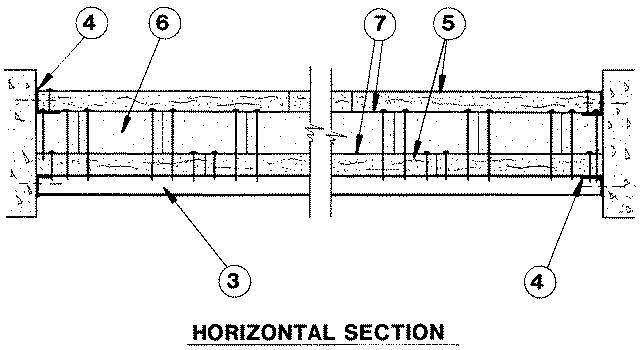 Horizontal Bracing Angles — 3/4 by 1-1/4 in., fabricated from 22 MSG galv steel, spacing between angles not to exceed 5 ft, long leg screw attached to wallboard. 4. Side Angles — 3/4 by 1-1/4 in. fabricated from 22 MSG galv steel, 30 in. long sections spaced vertically not more than 5 ft OC. 5. Gypsum Board* — 5/8 in. thick, 4 ft wide. Inner layer applied vertically and attached to floor, side, and bracing angles with 0.127 in. diam by 1 in. long, self-drilling, self-tapping, Phillips head steel screws spaced 16 in. OC. Outer layer applied vertically and secured to floor and side angles and ceiling runner or angle with 0.127 in. diam by 1 in. long steel screws spaced 12 in. OC. Joints between inner and outer layer staggered. CERTAINTEED GYPSUM INC — Types 1, FRPC, EGRG, GlasRoc, GlasRoc-2, Type C , SilentFX, Type X, Type X-1, Easi-Lite Type X-2, 5/8" Easi-Lite Type X.
CGC INC — Types AR, C, IP-AR, IP-X1, IP-X2, IPC-AR, SCX, SHX, ULX, USGX (Joint tape and compound, Item 8, optional for use with Type USGX), WRC or WRX. NATIONAL GYPSUM CO — Types eXP-C, FSW, FSK, FSW-G, FSW-C, FSK-C, FSW-3, FSW-6, FSW-8, FSMR-C, FSL, SoundBreak XP Type X Gypsum Board. PABCO BUILDING PRODUCTS L L C, DBA PABCO GYPSUM — Type C, PG-5, PG-9, PG-11, PG-C, PGS-WRS. UNITED STATES GYPSUM CO — Type AR, C, IP-AR, IP-X1, IP-X2, IPC-AR, SCX, SHX, ULX, WRC, WRX, USGX (Joint tape and compound, Item 8, optional for use with Type USGX), ULIX. USG BORAL DRYWALL SFZ LLC — Types C, SCX, USGX (Joint tape and compound, Item 8, optional for use with Type USGX). USG MEXICO S A DE C V — Type AR, C, IP-AR, IP-X1, IP-X2, IPC-AR, SCX, SHX, ULX, USGX (Joint tape and compound, Item 8, optional for use with Type USGX), WRC or WRX. 5B. Gypsum Board* — (As an alternate to Item 5 and 5A) — Nominal 5/8 in. thick, 4 ft wide panels, secured as described in Item 5. 5C. Wall and Partition Facings and Accessories* — (As an alternate to Item 5 through 5B) — Nominal 5/8 in. thick, 4 ft wide panels, secured as described in Item 5. 6. Gypsum Board* — 1 in. thick, 2 ft wide gypsum wallboard with square edges may be used. Attached to floor angles and ceiling runners and to horizontal bracing angles, with tapping, Phillips head steel screws spaced 12 in. OC Joints between core board and wallboard staggered. 6A. Gypsum Board* — As an alternate to Item 6, 1 in. thick gypsum wallboard liner panels, supplied in nominal 24 in. widths. Attached to floor angles and ceiling runners, and to horizontal bracing angles, with 0.127 in. diam by 2-1/4 in. long, self-drilling, self-tapping, Phillips head steel screws spaced 12 in. OC. Joints between core board and wallboard staggered. 6B. Gypsum Board* — As an alternate to Item 6, 1 in. thick gypsum wallboard liner panels, supplied in nominal 24 in. widths. Attached to floor angles and ceiling runners, and to horizontal bracing angles, with 0.127 in. diam by 2-1/4 in. long, self-drilling, self-tapping, Phillips head steel screws spaced 12 in. OC. Joints between core board and wallboard staggered. 6C. Gypsum Board* — As an alternate to Item 6, 1 in. thick gypsum wallboard liner panels, supplied in nominal 24 in. widths. Attached to floor angles and ceiling runners, and to horizontal bracing angles, with 0.127 in. diam by 2-1/4 in. long, self-drilling, self-tapping, Phillips head steel screws spaced 12 in. OC. Joints between core board and wallboard staggered. 7. Laminating Compound — Of the type used in joint treatment, mixed with water in accordance with instructions shown on containers, applied with an applicator producing beads about 5/16 in. in diam spaced 1-3/4 in. OC. Outer layer of wallboard temporarily nailed to core board until compound sets. Nails removed and holes filled with compound. 8. Joints — (Not shown) — Wallboard joints exposed or covered with fiber tape and joint compound. As an alternate, nominal 3/32 in. thick gypsum veneer plaster may be applied to the entire surface of Classified veneer baseboard. Joints reinforced.